We say: Bijou. These rooms are small but perfectly formed. All have views over our gardens. 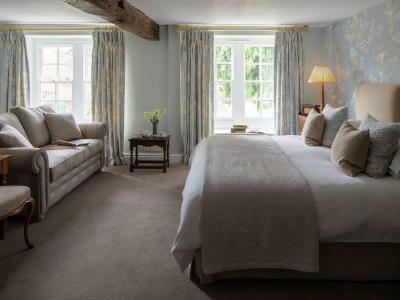 Vi-Spring beds, White Company linen, goose down pillows and duvets mean you will have a great night's sleep. Lovely Noble Isle products in the bathroom. All have been individually decorated with original Welsh art on the walls. Accessible? These rooms are split between the first and second floors. Two rooms benefit from a bath with shower and two have showers only. We say: These rooms are bigger than the petite classic doubles, with queen or king-sized beds and bathrobes for a great night’s sleep and extra comfort: Country style en suite bedroom, 215 sqf, offering free Wi-Fi, satellite TV/radio, DVD player, writing desk, direct dial phone, alarm clock, ironing station, tea and coffee making facilities, bathrobes, toiletries, and hairdryer. Queen-sized bed or two single beds. Accessible? 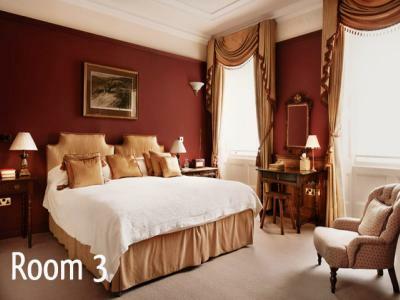 Three rooms are located on the first floor and one, in the cottage across from the hotel, is located on the ground floor. Two rooms benefit from a bath with shower and two have showers only. We say: This room is located in the cottage 100 metres from the main hotel, opposite the disabled access ramp. It’s of the same standard as the classic doubles: Country style en suite bedroom, 215 sqf, offering free Wi-Fi, satellite TV/radio, DVD player, writing desk, direct dial phone, alarm clock, ironing station, tea and coffee making facilities, bathrobes, toiletries, and hairdryer. King-sized bed or two single beds. Accessible? This room is located on the ground floor of the cottage and has a walk-in shower for mobility access. Parking is directly outside the entrance. We say: These rooms are bigger than the classic doubles, with seating areas and king-sized beds for that extra space and comfort. 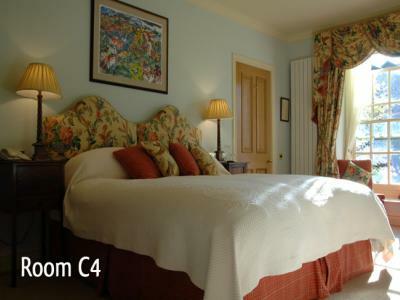 Three rooms are located in the cottage across the lawn from the main hotel. Two rooms have sofa beds if needed for children. 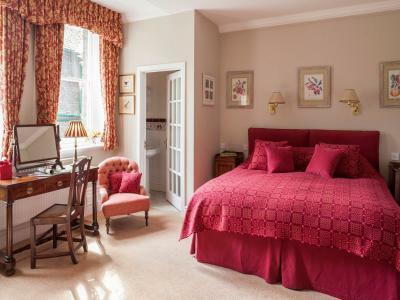 Rooms enjoy pretty garden views: Country style en suite bedroom, 280 sqf, offering free Wi-Fi, satellite TV/radio, DVD player, writing desk, direct dial phone, alarm clock, ironing station, tea and coffee making facilities, bathrobes, toiletries, and hairdryer. King-sized bed or two single beds. Accessible? These rooms are located on the first floor and benefit from a bath with shower. 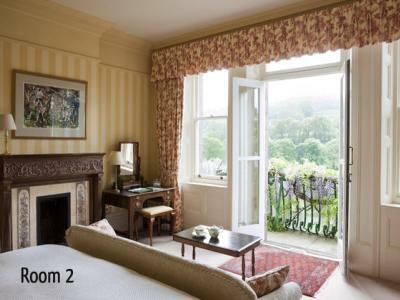 We say: These two rooms look out over the terrace and onto the River Usk below. In the summer, house martins nest in the eaves above the windows. Features include an old library with wood panelling and glass-fronted bookcases, and floral prints: Country style en suite bedroom, 280 sqf, offering free Wi-Fi, satellite TV/radio, DVD player, writing desk, direct dial phone, alarm clock, ironing station, tea and coffee making facilities, bathrobes, toiletries, and hairdryer. King-sized bed or two single beds. 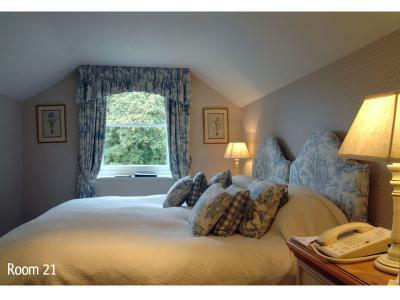 We say: These two rooms have glorious views of the River Usk and the hills beyond. Features include a small private balcony and original artwork by contemporary Welsh artists. Perfect for a romantic weekend away: Country style en suite bedroom, 280 sqf, offering free Wi-Fi, satellite TV/radio, DVD player, writing desk, direct dial phone, alarm clock, ironing station, tea and coffee making facilities, bathrobes, toiletries, and hairdryer. King-sized bed. Accessible? These rooms are located on the first floor. One has a huge freestanding bath and the other has a bath with shower. 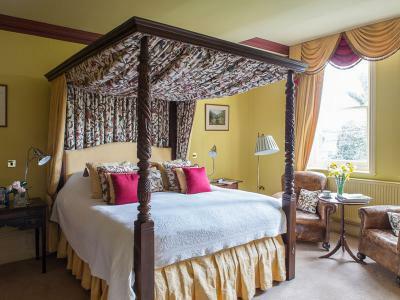 We say: This room is the largest in the house and features a four-poster bed with a hand-sewn crewel embroidery canopy. The room enjoys pretty garden views: Country style en suite bedroom, 301 sqf, offering free Wi-Fi, satellite TV/radio, DVD player, writing desk, direct dial phone, alarm clock, ironing station, tea and coffee making facilities, bathrobes, toiletries, and hairdryer. King-sized bed. Accessible? This room is located on the first floor and has a bath with shower.